I don't know how you celebrated your 61st birthday, but I did the Tempe International Triathlon, the international (and not sprint) distance, after flying home from New Jersey Saturday evening. I was going to be very happy with anything under 3 hours, and did -- 2:52:16. That pace might have been good enough to podium in some tris in my age group, but we had 7 men age 60-64 who did the race in 2:35 or less, and I've never been under 2:45 even in my younger days. So I was 8/13 in my division, while 243/331 overall. I was part of the TriScottsdale mob that took first place in the AZ Club Championships. I also made a couple of mistakes (I had cleat covers on my bicycle shoes, so I wasted 1-2 minutes trying fruitlessly to clip in until I realized what was happening; lost my only water bottle at the beginning of the second loop of the bicycle course, so I was dehydrated for the start of the run; and cut my leg awkwardly dismounting my bicycle) but still managed to run the entire 10K (except for walking through water stops). I'm told there will be pictures later, but they're not up yet. A very nice day, even if it started at 3:30 am. The best part? At packet pickup, the volunteer who got me my number and swim cap asked if I was under or over 40. When she learned it was my 61st birthday, she said I looked pretty good. How can you not have a good day after that? 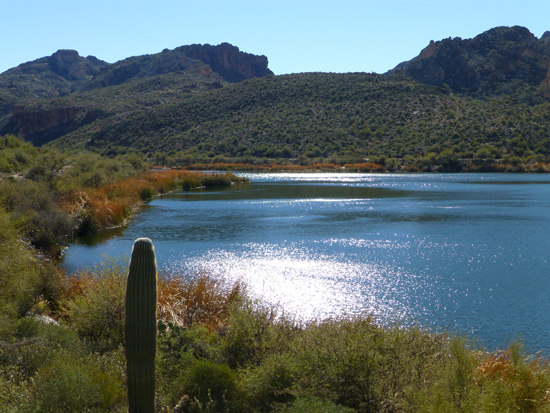 This swim was the third swim for the AZ Open Water spring series, and after a lackluster field showed up for Race #2 at Bartlett Lake, I was in third place overall and thought I needed to swim to protect my position. 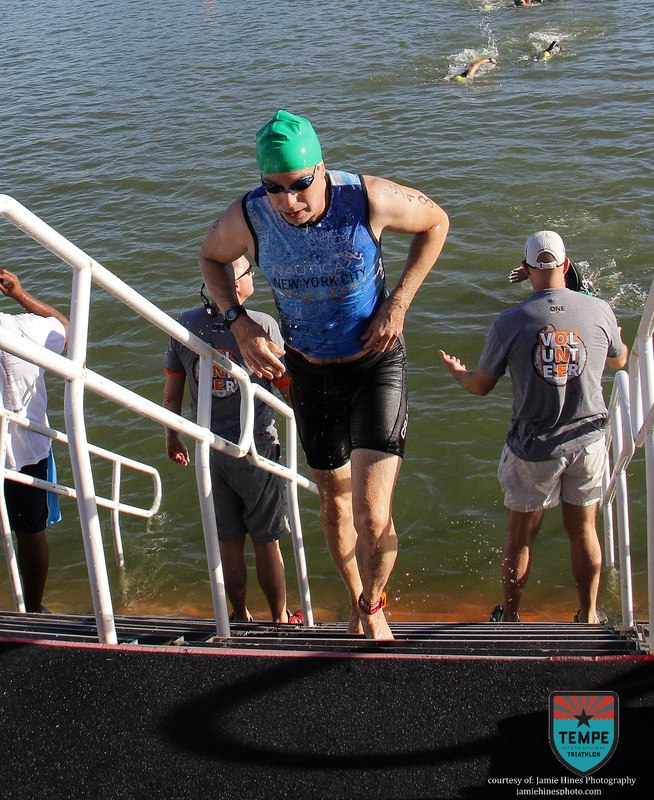 As it turned out, a much deeper field came out to swim on Saturday. Canyon Lake is the prettiest of the venues, and I think the same speed as 2 weeks before yielded 11th place, not third. So I slipped to fourth for the series, which would have been my ranking even if I had skipped this swim. But it was fun! 4500m in 1:27:20 (wetsuit), 11/14 masters men, 24/30 overall men, 50/58 everybody. My usual 16 minutes behind David Loeffler and 7 minutes ahead of Bill Straw. Series results here. I’ve been a bit preoccupied this spring with my Life Restructuring ProcessTM so I’m very late in getting out my fundraising email for this year’s Leukemia & Lymphoma Society event. Once again, a number of our Phoenix bicycle group are participating in the AMBBR century ride (100 miles) around Lake Tahoe to raise funds to fight blood cancers in honor of our friend Andy Gordon. This year, Andy is riding, with his one-year-old immune system. (It’s like a second marriage. We like this immune system so much better than the last one.) I have 8 days left to raise $1,800, so I’d appreciate you going to my Team in Training page, and giving what you can. If you want more background, it’ll be worth the time to click on a couple of links. First, Andy’s LLS video. They took it down when his cancer came back, but he and the video are back, baby. You also can review last year’s explanation of the ride and the cause; no need to repeat everything here. And this year, we’re the Gordon Unlimited Invitational at Lake Tahoe, or GUILT. (Seemed appropriate for our Jewish-Catholic bicycle group.) What hasn’t changed is our motto: Non semper est rectus, sed nunquam in dubium. And so should you. Regardless, good enough for a virtual podium! This wasn't an age group competition, but rather all swimmers 45+. So I was racing against 40-somethings, whom I'm not going to beat in this lifetime. Masters 3/9, men 8/16, overall 18/30. Full results here. Picture of the start here. Water temp was 68 degrees, so this was a wetsuit swim. I did like last year's "state championships" where the previous organizers of the Open Water Swim series did both age group and wetsuit/non-wetsuit categories, and pretty much everybody who swam won something. And there were only 9 men in the distance masters. But I will take it, yes, I will.